This issue of Samarpan focuses on the theme of devotion and how the inspiration for devotion can be ignited. We start with a beautiful story of how Radha Rani's true love seeks not her own happiness but that of her beloved. When the beloved is Lord Krishna himself, then the quality of love is divine. The nature of divinity cannot be explained in words but experienced in outcomes of words and deeds. Devotion is not an automatic process. Like any other endeavor, devotion needs to be practiced consistently to gain mastery. We share the art of learning about devotion through the Daily Sadhana course offered by JKYog. Also, we present all the wonderful updates of our past and upcoming community programs. 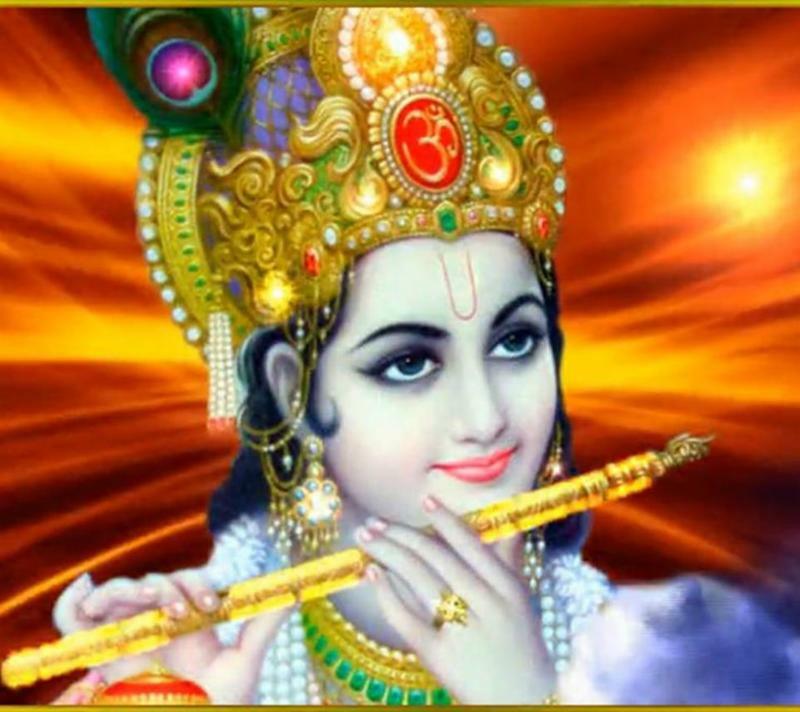 Legend has it that one time Lord Krishna became seriously ill. When Sage Narad asked the Lord what would cure his ailment, Shree Krishna said that the only cure was the Charna raj (i.e., dust of the feet) of an exceptional devotee characterized by selfless love and ananya bhakti. Narad ji heard the words and thought that this would be so easy because Shree Krishna had 16,000 wives and so many devotees. So he first went to the queen Rukhmani's palace and shared the news. The queen was distraught that her Lord was ill but she could not commit the cardinal sin of allowing Shree Krishna to apply her Charna raj on his body because it would land her in hell after death. All the other queens felt the same way. One of the queens told Narad ji to go to the gopis who were the Lord's purest of the pure devotees. When Narad ji went to the gopis, they thought were filled with joy at the prospect of receiving some news about Shree Krishna. When they found out that their Lord was ill and what it would take to cure him, they were bewildered. 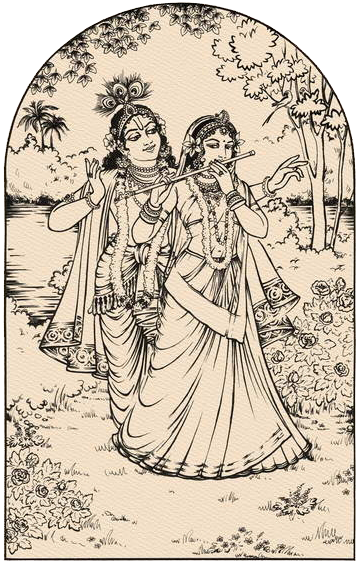 On the one hand they wanted to do whatever they could to cure Shree Krishna, however some gopis worried about the outcome of their sinful act (i.e., their Charna raj touching the Lord's body). 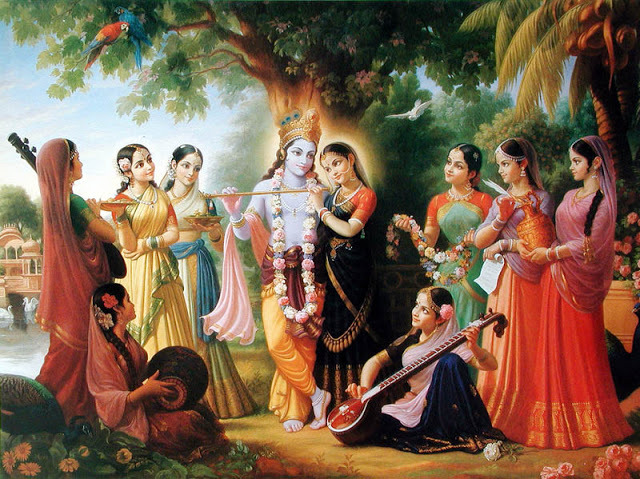 Other gopis worried that if Shree Krishna was not cured, their devotion would be suspect. So finally, Narad ji went to Radha Rani. When she heard about the situation, she readily gave as much Charna raj as she could manage and told Narad ji to go to Shree Krishna as soon as possible. Sage Narad asked Radhaji, "Like everyone else, aren't you afraid that you may go to any consequences of her actions. Her goal was to make sure that Shree Krishna got cured and did not suffer any more. Sage Narad understood that this was the only and purest form of love and devotion. 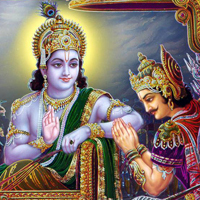 He returned to Lord Krishna and gave the Charna raj and the Lord was cured. When Rukhmani, Satyabhama and others got the news that Shree Krishna was cured from Radha Rani's Charna raj, they were curious about why Radhaji would commit such a sin. Then Lord Krishna told them that pure and divine love seeks the happiness of the soulmate without worrying about their own selfish gains or losses. Then they understood why Radhaji was special to Lord Krishna. In a different yug (historical time period), regular human beings possessed numerous divine qualities including various kinds of sidhis (supernatural powers). Unfortunately, many humans abused their divine powers for their selfish gains. So Brahma ji decided that it would be better for mankind if the quality of divinity was revoked from the humans and hidden where they could not access it easily. Brahma ji consulted with the other celestial gods about the best place to hide divinity. The gods suggested various locations - in the bottomless earth, the depth of the ocean or the highest peak of the mountains. But Brahma ji said that humans would search long and hard until they found divinity. All the gods spent a long time thinking about it and then Brahma ji came up with an idea. He said, "Human beings search for everything they want all around them; from one hemisphere to another and one pole to the other. However, they never search for anything hidden deep within themselves. So let us hide divinity deep within their own center and they will never find it." Since that time, human beings climbed the highest mountain peak, dove to the ocean floor, dug into the depth of the earth, and conquered unknown lands in search of something (divinity) that was always hidden within them the whole time. As Maharajji has said, "God is seated in the hearts of his devotees, and always protects them from within. 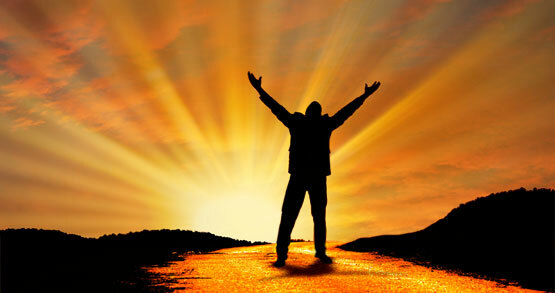 If we cleanse our mind by engaging it in devotional remembrance of God, we will find divinity." Many of us feel overwhelmed with our life and work demands and not able to find the time for daily sadhana or devotional practice. This is like a Catch 22 situation because if we do not practice devotion, we will likely experience greater stress because of not knowing how to manage life's challenges; the more stress we experience, the less likely we are to practice devotion. Becoming eternally entangled in the cycle of life and death and going through 8.4 million species of existence, we may lose the opportunity to pursue the true goal of life - to unite our soul with the Lord. The sustained practice of devotion or bhakti is the only thing that can help to break this cycle of life and death. Many of you might be aware that JKYog initiated an online course to help is accomplish the goal of spiritual practice. 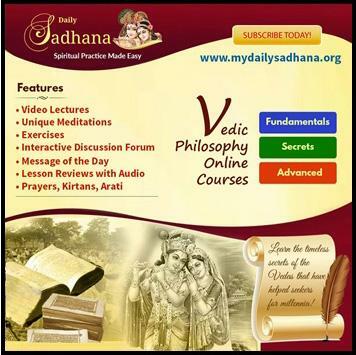 The course called Daily Sadhana, an amazingly and innovative way to learn spiritual practice. The course comprises a beautiful combination of Swami Mukundananda ji's audio-video lectures and guided meditation created exclusively for this course, recapitulation of main points, daily prayers and bhajans. Each lesson has simple and short quizzes to ensure acquisition of knowledge. There is a new bhajan for each lesson and an opportunity to engage in discussions and blog interactions for those who are interested. Each lesson takes only an hour but leaves a devotee filled with love for God and Guru, aspiration to reach higher goals, and nourishment for the soul. Take advantage of this lifetime opportunity and enroll in a very systematic and highly structured course through www.mydailysadhana.org. 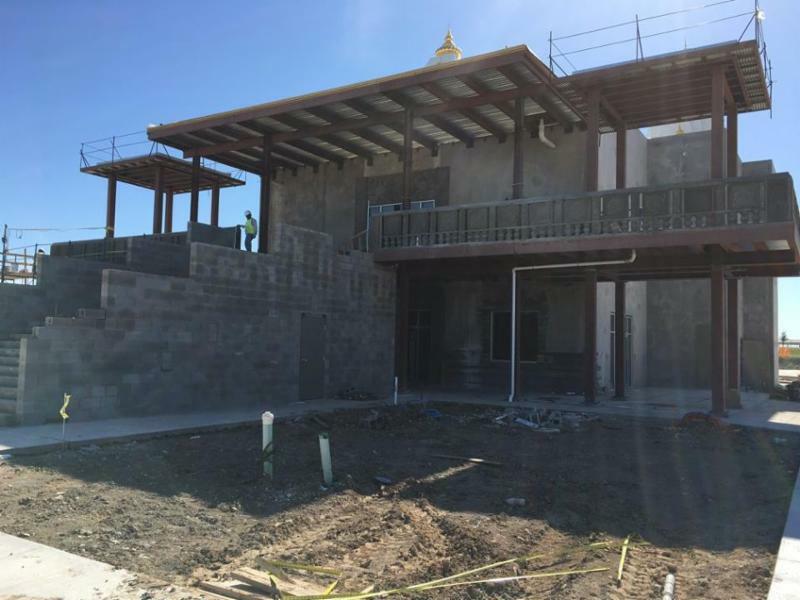 The sanctum sanctorum of the Radha Krishna Temple will be completed by the end of June in preparation for inauguration ceremony from July 4 through 11, 2017. A tour of the temple with Swamiji on March 25, 2017 was the highlight for many devotees. Seeing the beautiful shikhars and visualizing the completed temple was an emotional moment for many devotees. The sanctum sanctorum will be completed by the end of June in preparation for inauguration ceremony from July 4 through 11, 2017. "The one who contributes towards establishing God's pratima attains God's abode, and the one who contributes towards the construction of the temple and establishes the pratima will live there forever." 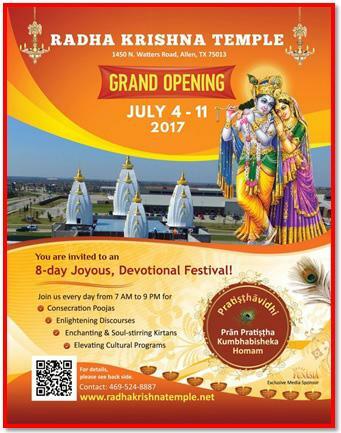 To avail the once-in-a-lifetime opportunity for Radha Krishna Prān Pratiṣṭha sponsorship, please contact 469-524-8887 | info@radhakrishnatemple.net. Be a part of International Yoga Day at the Dallas YogaFest, a world-wide celebration of yoga, where the ancient science meets modern day challenges of the body and mind. Dallas YogaFest will be one stop place to fulfill your need for knowledge and practice on healthy living! Be it yoga, meditation and pranayama workshops, informational sessions on holistic living, or meeting vendors of healthy products - we have it all in one place! Catch some glimpses of last year's events at https://www.facebook.com/Dallas-Yoga-Fest-1124590477603501/. For the benefit of the community, the Radha Krishna Temple provides abundant opportunities to volunteer and participate in various events. Read the benefits of each of these activities and related sewas for your body, mind and soul. These satsangs engulf a person in the ocean of bhakti through a combination of prayer, chanting soulful bhajans and kirtans, viewing a video lecture by Swamiji or Maharajji, followed by aarti and prasad dinner. Once a month we also recite Vishnu Sahasranama. God's names are no different from Himself. 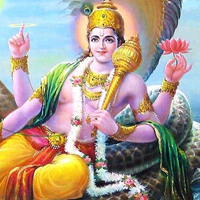 Every name in Vishnu Sahasranama (thousand names of Vishnu) is a drop of nectar. Whether we chant it or hear it, it gives an immense sense of peace and indescribable solace. For local satsang information visit:www.radhakrishnatemple.net or info@radhakrishnatemple.net. Robert Moment said "Public speaking skills are an essential key to achieving career advancement and success." Effective communication builds confidence and leadership skills. This is even more important especially for today's youth who aspire to be the leaders of tomorrow. The Radha Krishna Temple of Dallas has launched the Toastmaster Gavel Club for aspiring youths who are looking to become the cream of the crop in their future endeavors! Participating in this club will help to take the panic out of public speaking as well as help become a fluent speaker. We invite youth between the ages 10-18 years to join the club. At: 1292 Bossy Boots Dr.
'Dollar A Day' - Pledge Continuous Support! you'll help this noble cause! How many of us have the opportunity and are fortunate enough to build a house for God? 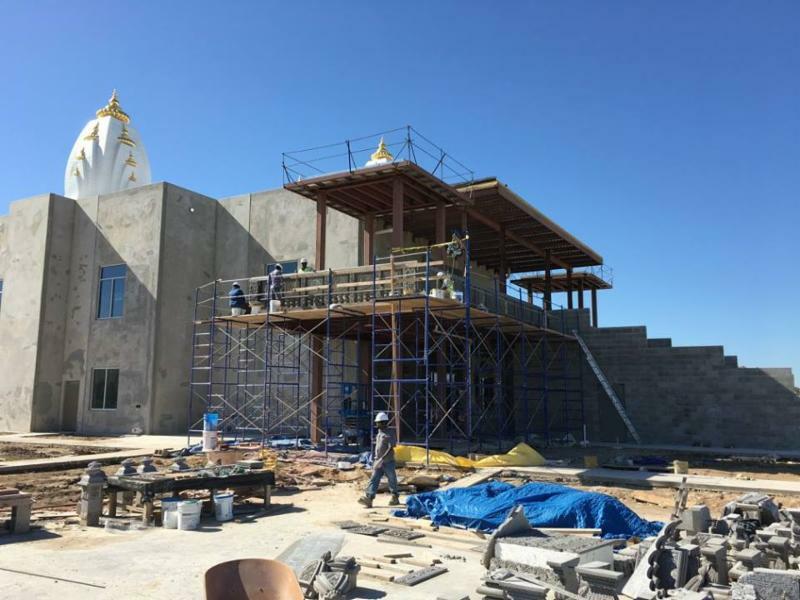 Set up monthly contributions through credit card/debit card by calling: 860-605-3685 or by visiting temple website at Radha Krishna Temple of Dallas (click). Copyright © Jagadguru Kripaluji Yog 2016. All rights reserved.